One of the features that wowed us when we first saw the Pixel Buds from Google was the instant translation feature – even if it worked a little slower than "instant" in practice. It appears the same feature is no longer a Pixel Buds exclusive, and has now rolled out to all headphones offering Google Assistant integration. Droid Life spotted the subtle but crucial change in the Pixel Buds support pages, which now state that "Google Translate is available on all Assistant-optimized headphones and Android phones" rather than only on the Pixel Buds and Pixel phones. The actual translating happens through Google Translate via whichever smartphone is connected to the headphones, so Google just needs to flick a switch to give third-party hardware access to the functionality. The likes of LG, Sony and JBL all have headphones with Google Assistant on board. At the moment, the real-time translation feature supports some 40 languages including English. The voice command "help me interpret..." then a language is enough to launch the Google Translate interface on the phone, with audio routed through the headphones and the phone speaker as you try and keep up a conversation. 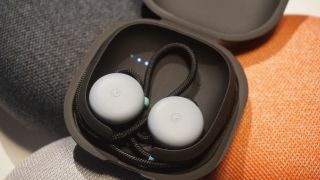 We're not sure exactly how the feature is going to work on headphones that aren't the Pixel Buds, or if translation will be limited to specific models from third-party manufacturers, but it looks like as far as Google is concerned it's open to all. "The Pixel Buds make translation a less awkward and more rewarding process, but nevertheless stilted by Google's own Translate app," we wrote in our original Pixel Buds review, so maybe don't cancel that Spanish course just yet. For quick and simple translations though, you've now got a broader choice of devices to pick from.